Also, I've changed up things a little bit while I was gone. I added links into the linkbar, wrote an About Angie page, shortened my posts on the main page with Suzy's help, and made the "Click to see more photos" link more noticeable by fixing the background colour (thanks to Jean and AN). Blogger friends really are the best :D Coding wizards to the rescue! What I want to know is what you guys think of the shortened posts. I know I'm the queen of picspam, but I think that was a characteristic of my blog. Lots and lots of huge pictures and building up your scrolling skills. However, it does clean up the site a lot. Please vote in my poll above - I'm considering changing it back to unshortened because I personally am too lazy to click the "read more" button most of the time if I'm not at the direct post. I've left this post unshortened for testing. Please see my main page for a feel of the shortened posts. 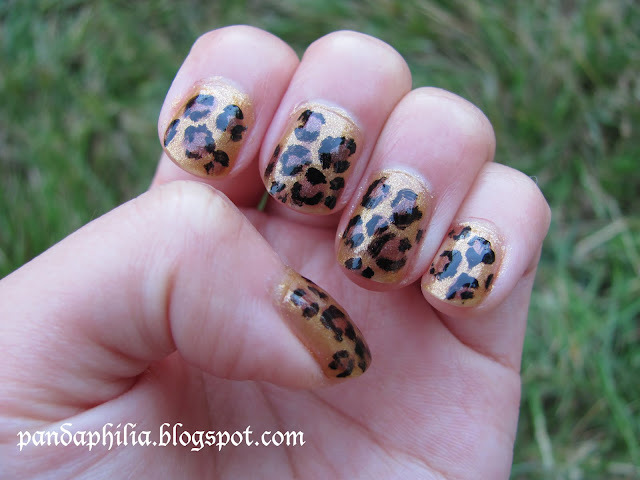 I first got the inspiration to do this mani from Lisa of LisaDrivesaVan (see her version here). 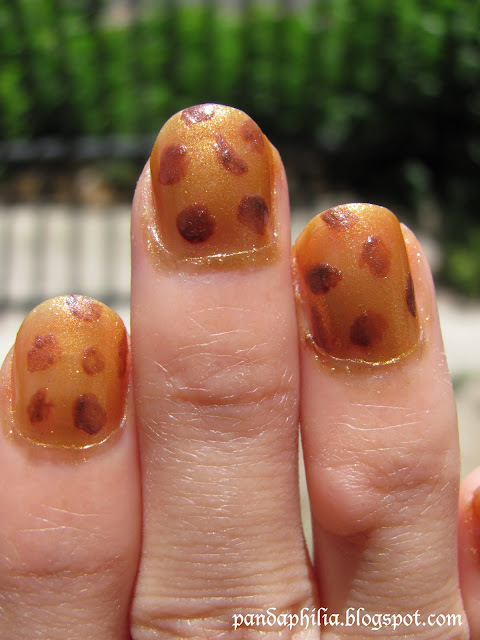 I haven't really been into leopard prints because I think they look kind of tacky and too club-goer for daily wear but who says you can't put a little ferocious feline into your nails? I was going to do a makeup look to complement this mani but that day it was a sauna outside - at that temperature it'd only melt off. I've been doing random looks though and taking pics : ) They will all be posted after 8/5, Judgment Day. I will also get back to all your sweet comments too. At first I was afraid that I didn't have the right colours and that the base coat would be too yellow, but it turns out a nice and warm gold when opaque. If you like what you see, try your hand at it by following the picture tutorial I made :D It was so hard trying to take pics with my left hand while not smudging the polish I just painted on the right hahaha. Step 1: Start off with clean nails. 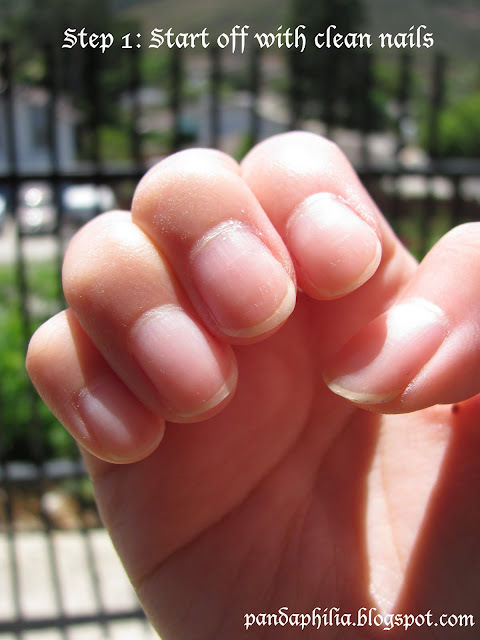 Remove your nail polish, let the acetone dry, wash your hands, etc. If you want, apply base coat. I'm not that fancy though. Step 2: Apply base colour until it becomes opaque. 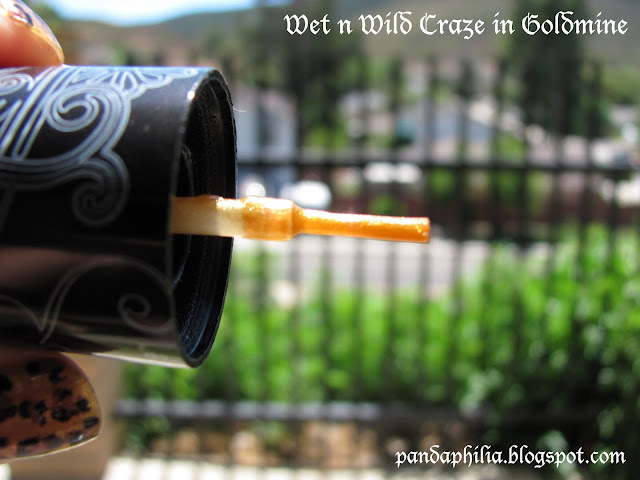 I'm using Wet n Wild Craze in Goldmine, with 3 coats for it to become the opacity I wanted. It's a very yellowish gold colour. I absolutely love these Craze nail polishes because their brushes are so short so you don't have to flail around to apply. They deposit polish evenly and the formula dries fast. Perfect! These are only $1.99 USD each at drugstores - super awesome deal. I just love cute packaging too! Step 3: Apply dot shade randomly. You don't have to be perfect! Draw kidney shaped little things or dots or hearts whatever you want - it's going to be covered with the black polish/eyeliner later. I'm using a super old bottle of Maybelline Express Finish in Mink in a Moment I got with a magazine subscription in like ... 7th grade HAHAHA. Now it looks like giraffes! Step 4: This is easier than it looks! I'll break it down in the pictures below. Draw squiggly C's around the dots you made. Be messy! 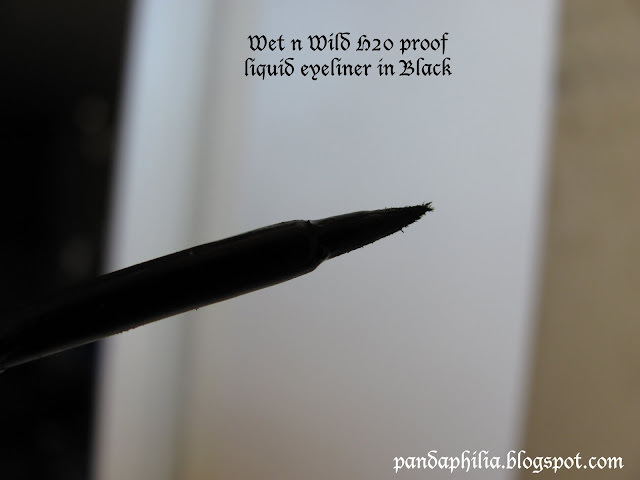 I'm using Wet n Wild H2O Proof Eyeliner in Black (yes, waterproof eyeliner - a tip from Lisa) because the tip of the wand has a lot more control than flimsy nail art polish brushes. If you have the pro materials, go for it. Otherwise, you can choose a cheap eyeliner you don't use anymore and use it as an alternative. I suggest you don't use that eyeliner on your eyes after this. The top nail is in the process. I just made a C wrapping the brown dot I made earlier. And I made another C on the other side. Leave some gaps! I really love this eyeliner too ... I'll have to pick up another one because I used it for this mani and plus it's drying out xD The tip might get destroyed after you use it on your nails. Step 5: Be very careful! Gently glide topcoat over the nail. 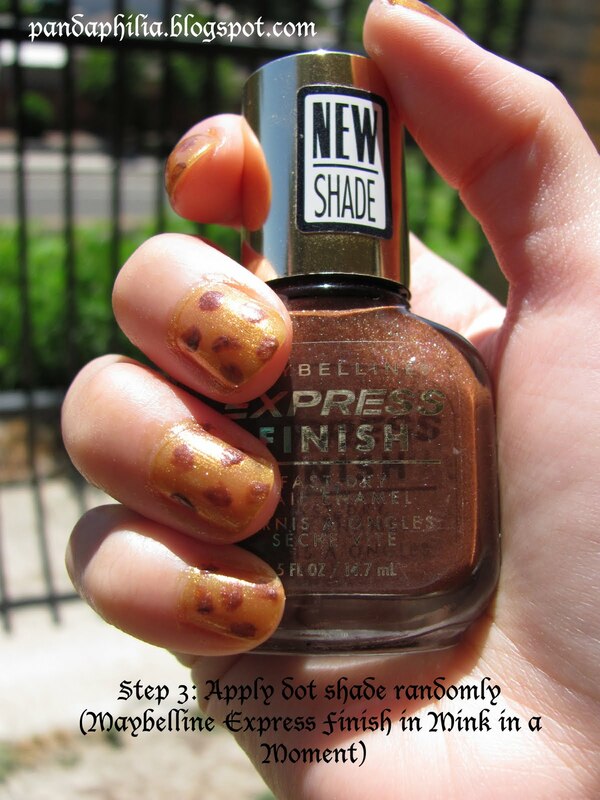 Use a super light hand and let the first coat dry before applying another layer. It will smudge a little but that's okay! 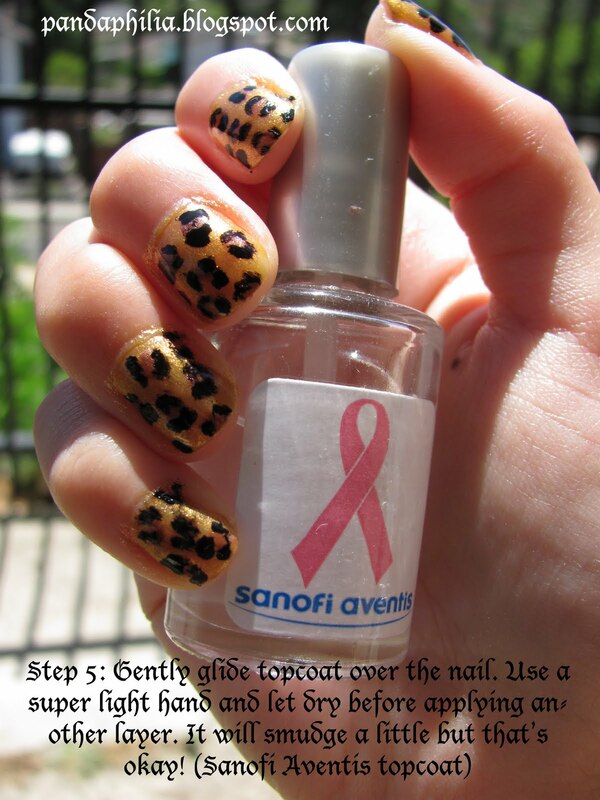 I'm using Sanofi Aventis topcoat .. very random one I found in the drawer. 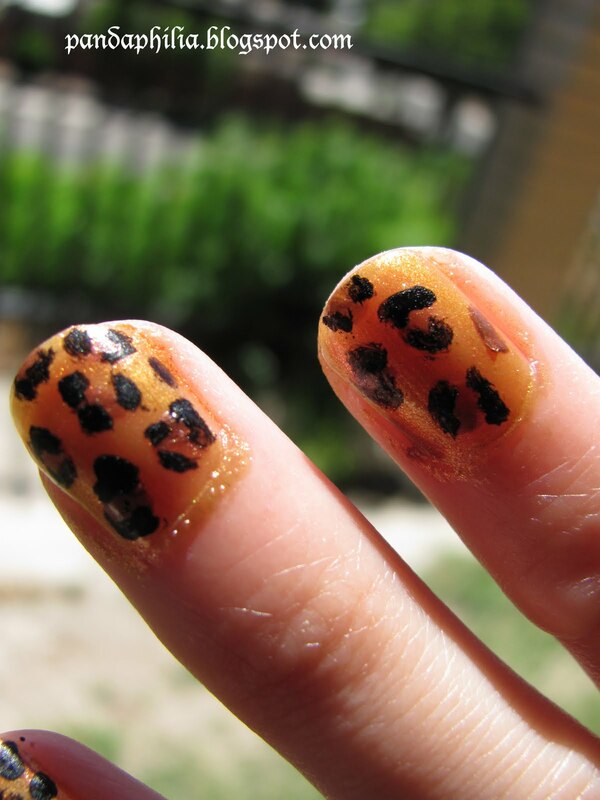 If you press down hard with the brush, it will smear like on my pinky nail and end up not-so-pretty. 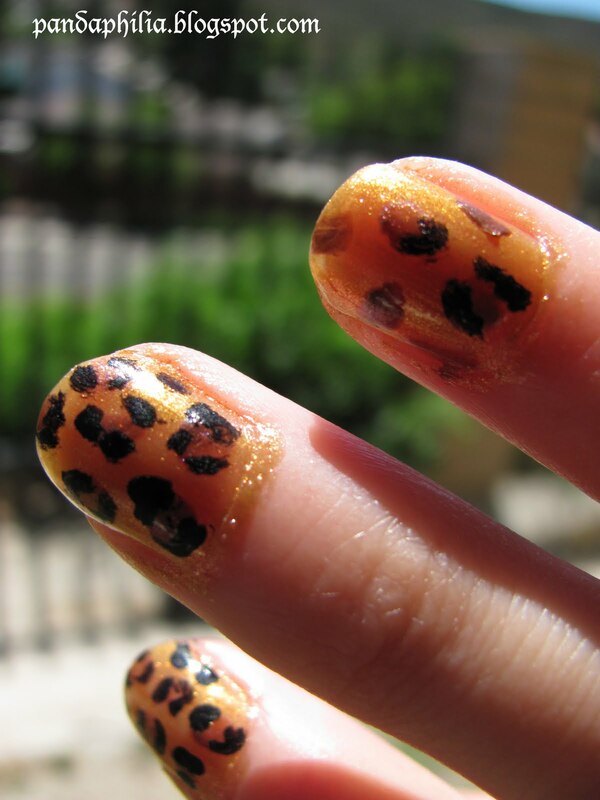 Barely touch the brush to the nail and let the topcoat kind of drip down. From a distance, you can't tell there are smudges or smears at all : ) After a few days the eyeliner will start to wear off if the topcoat chips. My nails have lasted for over a week now and they look fine. 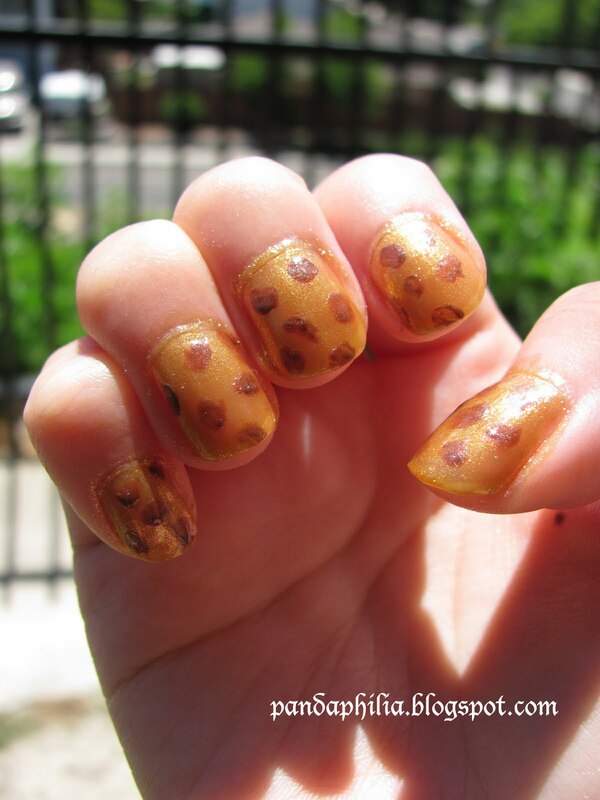 Enjoy your new hot leopard print nails! Feel free to use different colours. I went for a conservative (if you could call it that) colour palette. 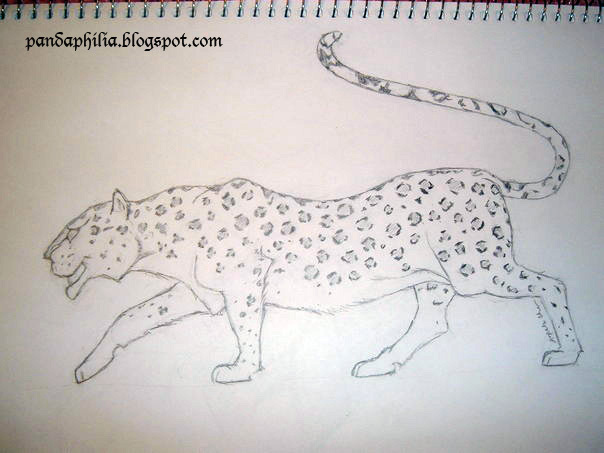 I've seen cute snow leopard ones, or hot pink and turquoise, etc. Have fun! 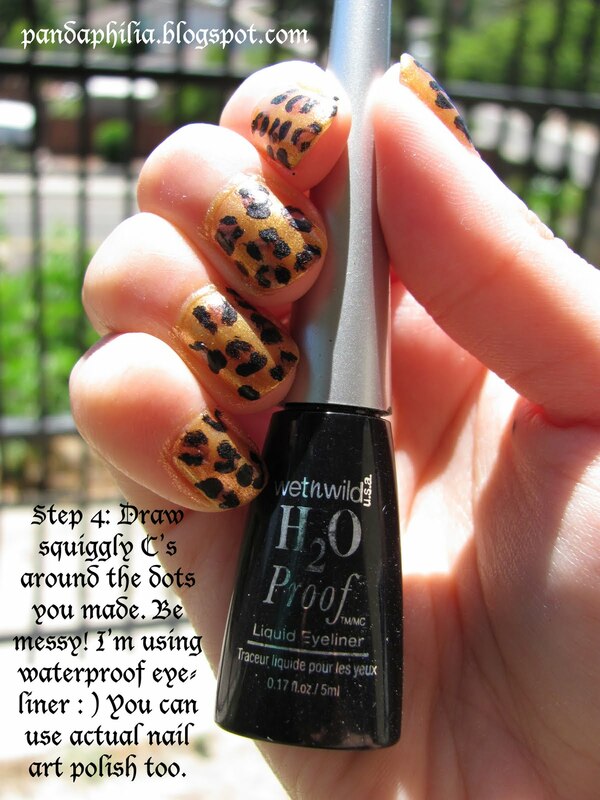 I never knew you can use liquid eyeliner to do nail art! Yeah I'm not sure about the scrolling vs. shortened posts either, that's why I also have a poll up on my blog... so far it seems like more ppl prefer scrolling through full posts, but shortened posts do look neater when you're revisiting the blog and looking through older entries. Wow, it is lovely!! 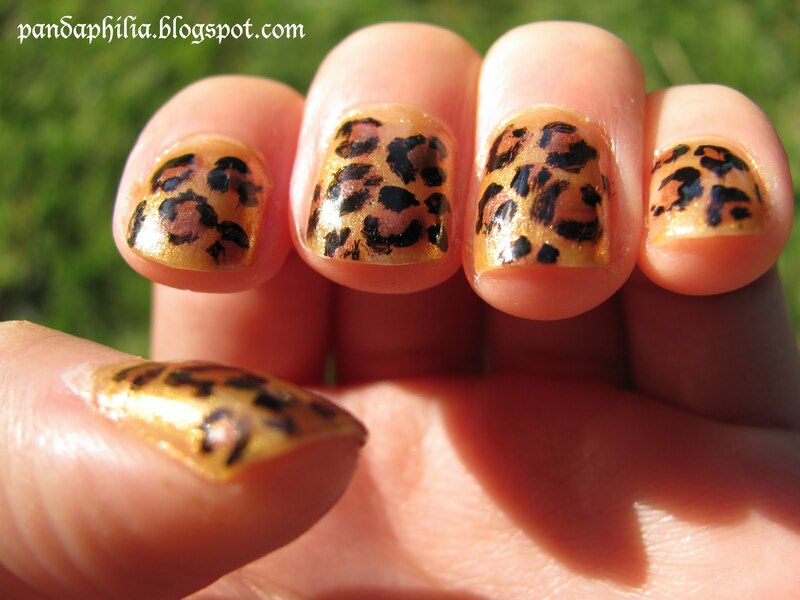 :-)))) I absoloutely adore the Giraffe nails, so pretty! :-) Thanks for sharing, Angie! Ive done this before, its so much fun! Eyeliner!! 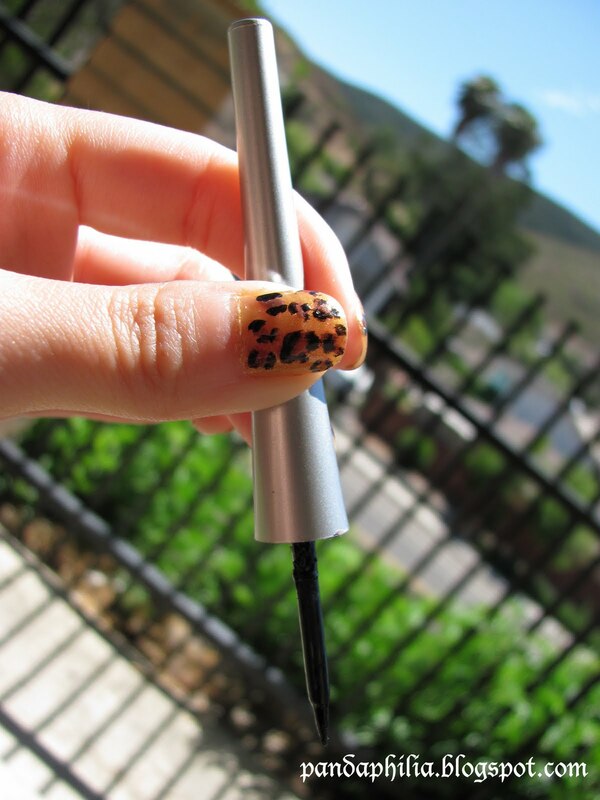 Never thought of eyeliner but that is a fantastic idea! Thanks for sharing. 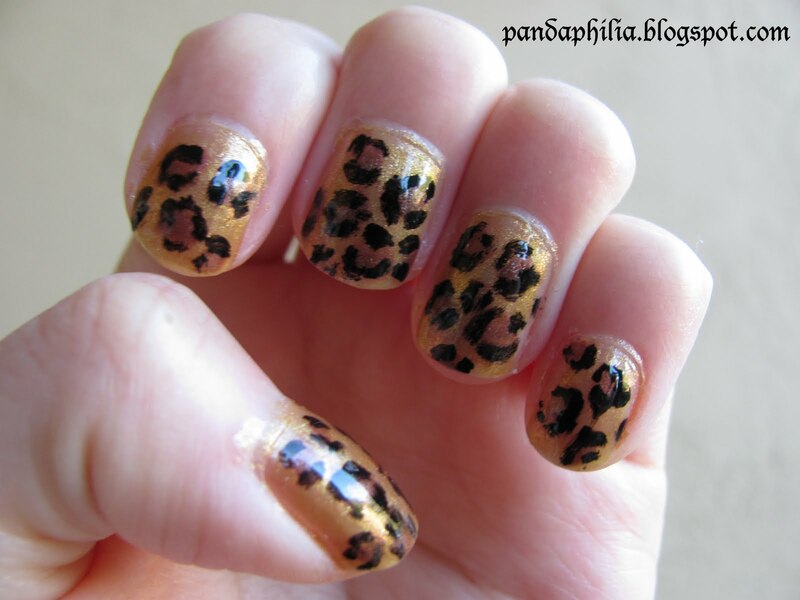 I love leopard nails but I never do cuz i wear too much leaopard prints... hehe ^^ love the drawing. you are talented, smart, beautiful AND artistic!! angie you are definitely an artist. 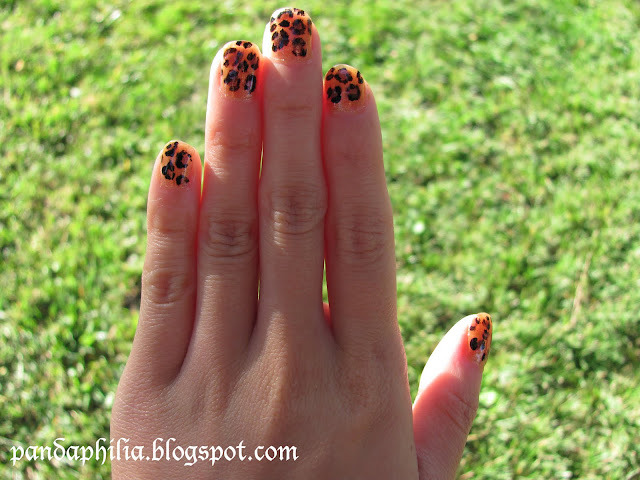 i am crazy about the animal print nails!! they look awesome. the eyeliner -- i'd never think of using that! and i love the new things uve added to ur page i just read ur about page and i couldnt help smiling!! angie this is so cute!!! i want to try it ASAP! for me to be able to put that top coat on? Looks so cute on you! Ooh I likey! I've been wanting to try zebra/giraffe/leopard print on my nails for some time now. Nice, simple tutorial! I read your about page, I'm a size 3 too hahaha. Most of the time I just give up and wear oversized shoes. gorgeous nails, you make it look so easy.. I might give it a go sometime - thank you!! OMG I love it! I can't believe you did it yourself. 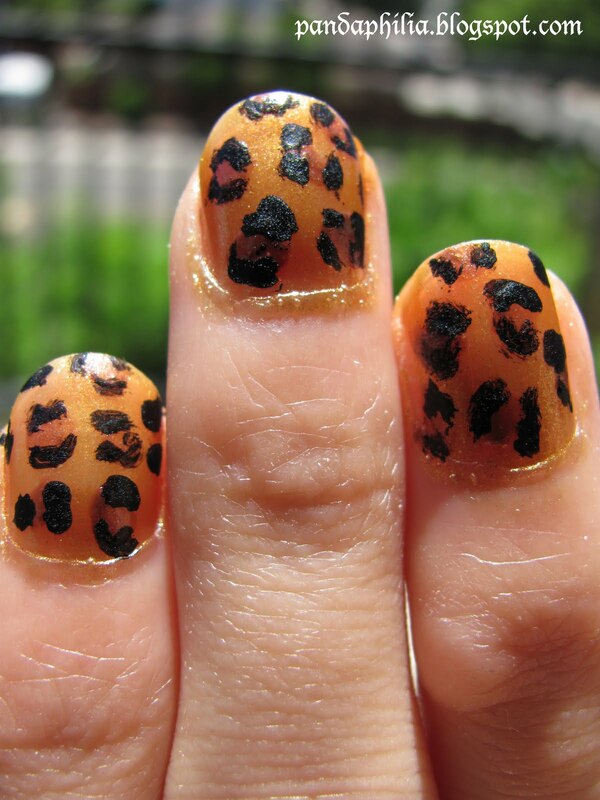 I can't even paint my nails myself, let alone do this! I'm a leftie so I can never paint the nails on my left hand, lol! LOVE!!! 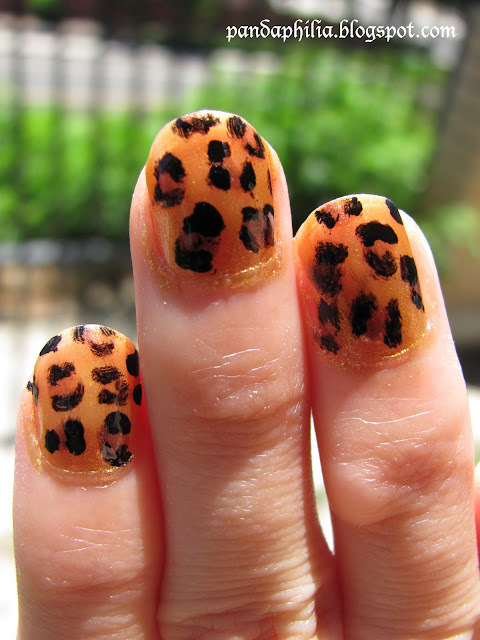 I gotta try to do this as I usually do my own nails too!! I'm definitely gonna try this! Love it!